You are here: Home / Events / Events / FESTIVAL CHOIR – Calling all Singers: Join us for a Once-In-A-Lifetime Musical Event! Calling all Singers: Join us for a Once-In-A-Lifetime Musical Event! 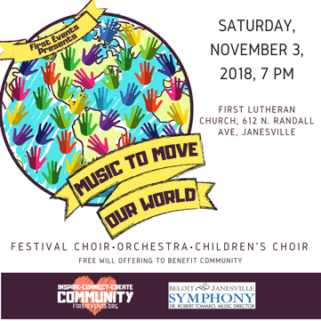 Music to Move Our World is a community-building celebration of music, visual elements, and guest speakers, and features an adult and children’s chorus accompanied by the Beloit Janesville Symphony Orchestra. The program focuses on the concepts of Home and Community- both here in Southern Wisconsin and around the world. Music and other elements are used to paint a more complete picture of who we consider our neighbor, to soften the divisive barriers that have historically isolated us from one another, and above all to illustrate the joy receive- and give- when answering our Christian call to reach out in love for one another. All interested singers are encouraged to join our adult chorus. A meal and the choral music will be provided. All proceeds from the event support several charities and future similar events; participants are asked to consider a donation of $10 to help cover music, meal, and the commemorative DVD which will be given to all following the event. – A dress rehearsal and dinner will be held at the church prior to the event on Saturday, Nov. 3, 3:00-6:00pm. For more information, and to sign up for the Adult Chorus contact Jan Knutson, Choir Director at First Lutheran at jknutson604@gmail.com or (608) 921-6534.